Aloha and Welcome to Mikey's Favorites! We use the finest ingredients and our cookies are made fresh in Honolulu, Hawaii. 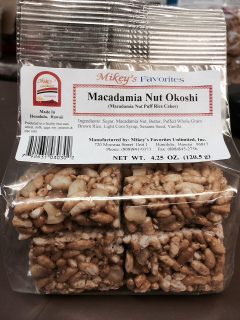 We are also the home of Hawaii's famous Golden Flakes cookies. All flavors come in 4.25 oz. packages $6.00 per package. We only keep a limited amount of okoshi shock on our shelves. You are welcome to order in advance to insure availability. One week advanced notice needed. Please call for more details. Copyright © 2018 Mikey's Favorites Unlimited, Inc. All Rights Reserved.